On May 7, 1945, only two weeks after the funeral of President Franklin D. Roosevelt, the White House press office issued a short statement: the new president, Harry S. Truman, planned “to make an announcement to the nation by radio at 9 o’clock tomorrow morning.” The end of World War II in Europe was at hand. The press release was probably typed by Elizabeth (Phillips) Brite, a Bowling Green native, graduate of the Bowling Green Business University, and secretary to White House press secretary Jonathan W. Daniels. Elizabeth was uniquely situated to witness Washington’s anticipation of the Nazi surrender. On May 1, Truman had authorized Daniels to state that should hostilities cease, the President would “emphasize the necessity for thankfulness and for continuation by all Americans in the great war job which still lies before us.” On May 2, the State Department released a chronology of the week’s negotiations with Germany–the summons of a Swedish intermediary, German commander Heinrich Himmler’s secret peace offer and his claim that Hitler was fatally ill, and America’s coordination with its British and Soviet allies. Having demanded that capitulation be unconditional and delivered to all three Allied governments, President Truman agreed with London and Moscow that their announcements of victory would be simultaneous. In Truman’s May 1 message, he had hoped that “there will be no celebration” in light of the unfinished struggle against Japan. Fred Vinson, a Kentuckian directing the Office of War Mobilization, took a similar stance. 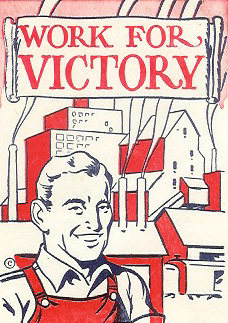 The government would “not attempt to prescribe a rigid rule of conduct” for local celebrations of victory, but he urged that there be no break in war production and “no greater interruption of normal activity than the peoples’ sense of sober rejoicing demands.” Although many heeded his request for restraint, Victory in Europe Day–May 8, 1945, which also happened to be President Truman’s birthday–nevertheless brought jubilation. Press releases and other materials relating to V-E Day are part of the Henry and Elizabeth Brite Collection in the Manuscripts & Folklife Archives holdings of WKU’s Department of Library Special Collections. Click here to access a finding aid. For other World War II collections, search TopSCHOLAR and KenCat. 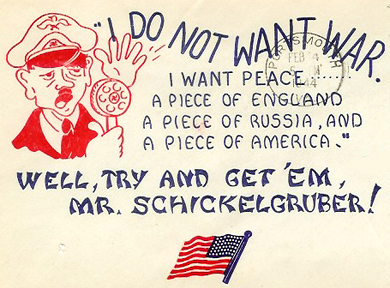 World War II-era envelope illustration (SC 1819) mocking Hitler by using the name of his father’s unwed mother.